Lally Column & Basement Pole Covers are attractive options for covering metal column and basement poles. 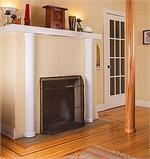 Our economical wood covers make it easy to beautify your metal columns or basement poles. Our covers will surround 3" to 4" diameter poles and are water and pest resistant, and are available in paint-grade wood or Maple, Oak, Cherry or custom veneers. Installation is simple -- height and width can be cut to fit, and covers can be field oiled or stained to match any decor. These Wood Lally Pole covers will cover 3" to 4" diameter poles. Price includes pole, cap & base molding,and spacer material. Available in Paint Grade, Oak, Maple and Cherry.